2018 may have been fraught with political and financial mayhem, but it was a banner year for barbecue. It was a year of new grills, new live-fire cooking techniques, and some terrific new barbecue restaurants. Here in Raichlendia, the year brought new books, new TV shows, new grilling friends, and a wide world of new grilling experiences. Here are some of the highlights. I’d love to hear about your year in barbecue—let us know on The Barbecue Board, Facebook, Instagram, and Twitter. January: My year began with a bang—or more appropriately, with a blast of wood smoke—as I headed to College Station, Texas, to attend Camp Brisket. 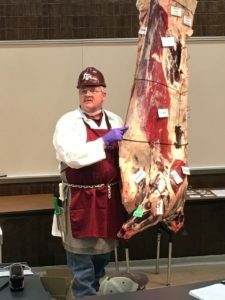 This intense two day and night seminar hosted by Foodways Texas and the Meat Sciences Department of Texas A & M University covers everything you want to know about brisket: its anatomy, chemistry, physics, and of course, how to trim it, season it, smoke it, carve it, and serve it. The faculty included some of the biggest names in Texas barbecue: Aaron Franklin, Tootsie Tomanetz, Wayne Mueller, and Camp Brisket professor Dr. Jeffrey Savell. Blind tastings dispelled a lot of preconceived notions, like how much difference the smoking wood variety makes (not much) and the supposed superiority of prime versus choice versus select brisket (not as true as you think). When they wheeled out a whole steer carcass, we students reacted not with horror, but by licking our lips! A perfect start to the research for my next book, The Brisket Chronicles, due out in April, 2019. February: It was a family reunion of sorts—of the producers, cameramen, sound and lighting people, food stylists, field chefs, and fire wranglers who comprise the crew for my PBS TV shows. 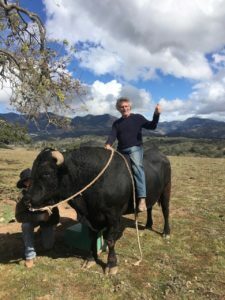 We converged on the gorgeous Alisal guest ranch in Solving, California, for two weeks to tape a brand new TV series for American Public Television: Project Fire. We braved record breaking cold (I hope it doesn’t show too much) to tape episodes that included Extreme Grilling, Wrangler Tailgate, and Fusion ‘Que. We grilled salmon on shovels and lobsters in the embers and turned monster beef ribs into pastrami. Brand new this year was a series of field trips that took us to some of the top grill restaurants in southern California, from Industrial Eats and The Bear and Star in the Santa Ynez Valley to Chi Spacca, Charcoal Venice, and Odys + Penelope in Los Angeles. What was your favorite episode of Project Fire? March: You may remember from last year, I taped a TV show in Italy. 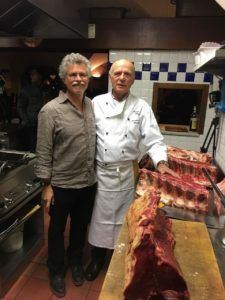 In March, the Italian food network Gambero Rosso began airing my Italian TV show: Steven Raichlen Grills Italy. In 10 episodes we crisscrossed northern Italy, stopping in Venice, Florence, Portofino, the Dolomites and many other amazing destinations. I met local grill masters and tasted their specialties. Then we took over a villa in Tuscany and I created my own versions of Italian grilling. You should have seen the reactions of the crew when I grilled a bistecca alla Fiorentina (Florentine steak) directly on the embers. The grilled pizza with clams and smoke-roasted chocolate bread pudding left them senza parole (speechless), too. 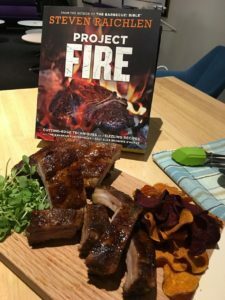 April: My longtime publisher, Workman, released my 31st book, Project Fire—focusing on the new trends and techniques revolutionizing the art of barbecuing and grilling. From the Caveman Porterhouse on the cover to the improbable but irresistible Grilled Eggs, Hay-Grilled Mussels with Charcoal Butter, and Salt Slab-Grilled Chocolate Brownie S’mores, the goal of Project Fire was to take grilling out of the box and over the edge. It’s hard to believe how much live-fire cooking has changed since I wrote my first book on the subject, The Barbecue! Bible. Incidentally, this year marks the 20th anniversary of The Barbecue! Bible—a book that certainly changed my life, and I hope has changed yours. May: May found me at another reunion of sorts—at the 10th anniversary of Barbecue University at the Broadmoor resort in Colorado Springs. 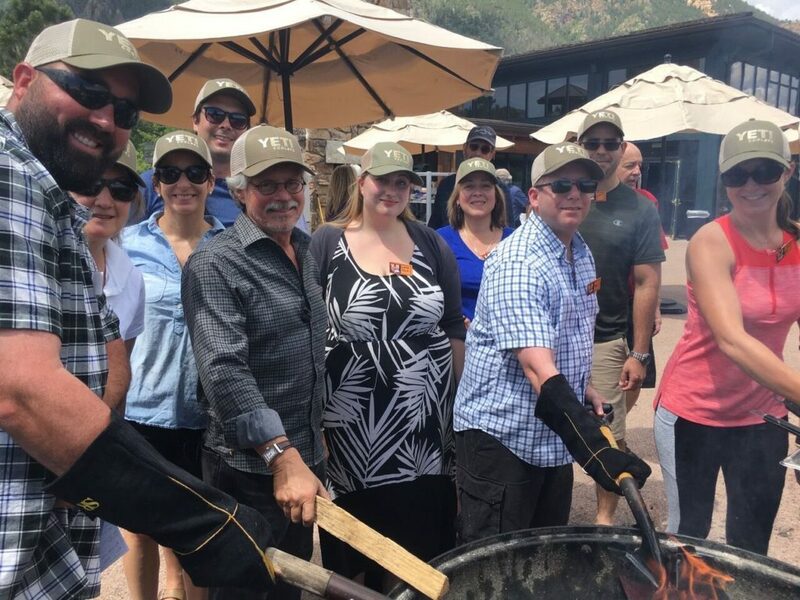 Once again, we hauled our collection of 40-plus grills and smokers to our sweeping terrace/classroom at Cheyenne Lodge, with its breathtaking views of the mountains. And once again, students from all over Planet Barbecue arrived for three smoke- and fire-filled days and nights of barbecuing, grilling, feasting, and general carousal. On the menu: Texas torpedoes (brisket-stuffed poppers), pastrami pork loin, huli huli ribs, finger-burner lamb chops, Brazilian grilled pineapple, and much more, with grilled sangria and smoked peach bellinis to wash them down. The 2019 dates for Barbecue University are May 23 to May 26 and May 26 to May 29. Space is limited, so sign up today! June: The sixth month of the year means one thing in the Raichlen calendar: book tour. And this was one for the record books. In four weeks, I crisscrossed North America, from Baltimore to Los Angeles, from Portland to Chicago, from Atlanta to Toronto. I did fundraisers for PBS stations, including Maryland Public Television in Baltimore and WFWA in Ft. Wayne. I reunited with old friends, like Joan and Jim Cattey at Smoke ‘n Fire in Kansas City and Billy Durney of Hometown Bar-B-Que. A barbecue crawl in Houston took me to Killen’s, Gaitlin’s, and Roegel’s (try doing that in 8 hours!). Unlike most authors (who say they hate touring—they’re lying), I love book tour. 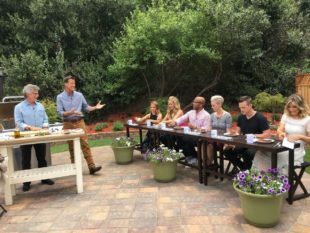 I love the opportunity to discuss my new book—to see which dishes and techniques people respond to the most. Most of all, I love the opportunity to meet and talk with you, dear readers. Starting in May, I’ll be on tour for the new book, The Brisket Chronicles: events will be added here. July: We celebrated the Fourth with another bang—a front page story in the New York Times Food Section on the renaissance of wood grilling (written by yours truly). From restaurants like Amara in Miami, Lilia in Brooklyn, and Gwen in Los Angeles, a new generation of chefs are turning to the oldest method of cooking and harnessing the flavor- boosting virtues of grilling over a wood fire. And wood grilling has come home, thanks to a new generation of wood burning grills, like the Kalamazoo Hybrid Fire Grill, Grillworks, and the affordably-priced Kudu grill. The story included recipes for Grilled Swordfish Kebabs with Golden Raisin Chimichurri and Grilled Pork Chops with Peanuts and Cilantro. Click here for the story. Do you grill on wood? Tell us about your adventures. August: Finally, vacation!! My travels were limited to quick trips to Montreal and Atlanta. (For me, just two trips in a month is a light schedule.). I got to concentrate on the real business of August, which is to relax on the beach in Martha’s Vineyard. Maybe it was more of a busman’s holiday, for our beach outings involve some pretty heavy-duty grilling. Together with my partners in crime, Mitch and Jared Reiter from the amazing Camp Towanda (they’re also our neighbors), we pack up the SUVs and headed for the beach at nearby Katama Bay for a feast that lasted 6 hours. 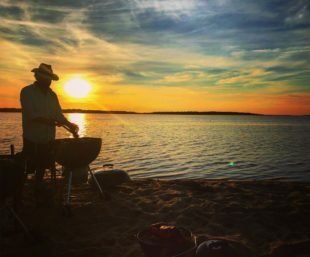 Local oysters, freshly dug clams, lobster, striped bass, summer corn—everything edible did its turn on the grill. No sooner have we extinguished the last ember, then we’re planning next year’s outing. September: Back to work, which this year meant reviewing the galleys for The Brisket Chronicles. Up to now, I’ve been working with manuscript, which I turned in in May. 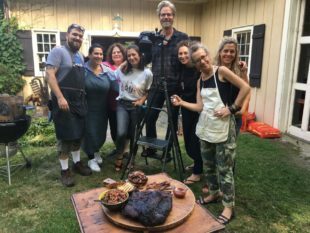 We did the photo shoot at the farm of photographer Matthew Benson (you know his work from Project Smoke; Barbecue Sauces, Rubs, and Marinade; and Project Fire), and our good friend, food stylist Nora Singley was there to make sure the food looks as fabulous as it tastes. But it doesn’t really start to feel like a book until the type is set in galleys. That’s where the text, recipes, and photos come together, and a dozen people are reading the galleys to make sure all i-s are dotted and t-s crossed. The Brisket Chronicles is my love song to Texas barbecue, Jewish pastrami, Irish corned beef, Montreal smoked meat, Italian bollito misto, Vietnamese pho and much more. The book is due out in April, 2019, but you can pre-order a copy today. October: One of the best parts of my job is that it requires traveling to other countries to research barbecue—tough work, as the saying goes, but someone has to do it. The first stop on this year’s research trip was London, which is undergoing a revolution in wood-fired grilling. Consider the new ROVI restaurant in Fitzrovia, where Israeli-born chef Yotam Ottolenghi has made wood-grilled vegetables the focal point of this stylish new restaurant. Then it was on to Brat in trendy Shoreditch, where chef Tomos Parry brings a Basque twist to grilled seafood. (Brat is English slang for turbot.). 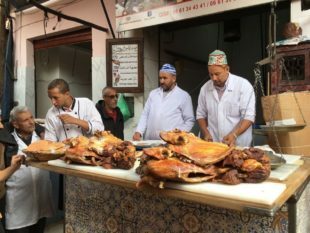 From there, we traveled to Marrakech, where I did a barbecue crawl in the liveliest public square in the world—the Jemaa el Fna. Come nightfall, the snake charmers give way to a veritable city of stalls, grills, tables and chairs, and outdoor restaurants, serving simple but gorgeous grilled lamb, chicken, seafood and vegetables. Barbecue sauce in these parts turns out to be a sort of cumin-scented tomato vinaigrette called charmoula. I also discovered what for me was a new dish—tangia—beef and preserved lemons cooked for half a day in a small sealed clay pot in charcoal embers. November: Midway through my vacation, I got another assignment from the New York Times—this one having nothing to do with barbecue. But since the project took me to one of my favorite places on the planet, I couldn’t say no. 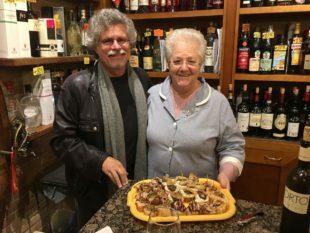 My mission: to write about the bacari (wine bars) of Venice. Bacari specialize in cicchetti (pronounced “chee-KEH-tee”), the Venetian version of tapas—bite-size snacks consisting of every imaginable sandwich, crostino, meatball, salad, kebab, and fritter—each more colorful and flavorful than the next. You can eat and drink yourself silly and get change from 25 Euros. Best of all, in a city besieged by 20 million tourists a year, the bacaro is one of the few places where you actually get to hang out with Venetians. Sorry, I know it’s not barbecue, but it’s a fascinating foodie phenomenon—one I hope to be writing about a lot in the coming year. December: Back to work and back home to Miami, where I’m thinking about all the amazing people I met and places I ate in 2018. Among the people: Tootsie Tomanetz, the octogenarian pit mistress of Snow’s BBQ in Lexington, Texas; the irrepressible Aaron Franklin of Franklin Barbecue and the new Asian smokehouse, Loro, in Austin, and Will Horowitz, who serves what may be the best pastrami sandwich in New York at his new school delicatessen, Ida and Harry’s in the Lower East Side. (Yeah, that Will Horowitz—the guy who created the watermelon “ham” that went viral this past year.) Among the memorable restaurants: Band of Bohemians (the Michelin-starred, wood-burning grill brew pub in Chicago); Parks Barbecue, with its binchotan-burning table grills in Los Angeles’ Koreatown, Gwen in Los Angeles (home of the 80 day dry-aged steak), and Kyu in Miami, where brisket gets the Asian treatment, served with lettuce leaves, Korean barbecue sauce, and, gasp, chopsticks! Oh, and I can’t forget Bubba—the wagyu steer I rode at the Fess Parker Winery and Ranch during the taping of Project Fire. And 2019? It’s shaping up to be an equally exciting year, with new books, classes, and TV shows. Perhaps I’ll write a book on Venetian tapas and the wine bars that serve them. I’m thinking very seriously—and don’t shoot me for this—of writing a book on vegetable and vegetarian grilling. I’m excited about the release of The Brisket Chronicles, and three foreign titles: Steven Raichlen Grills Italy, which comes out in Italian in March, Flames et Braises(the French language edition of Project Fire, due out in May) and a brand-new edition of Le Bible du Barbecue (The Barbecue Bible) in French. Come see me at Barbecue University, or when I come to your city on book tour. Until then, I wish everyone a happy, healthy, and barbecue-filled New Year. May your grills burn bright in 2019! 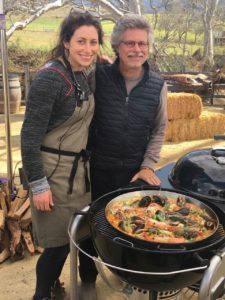 The post My Year In Barbecue: 2018 appeared first on Barbecuebible.com.